Welcome to the monthly e-bulletin of the South Asia Media Solidarity Network (SAMSN). The next bulletin will be sent on January 15, 2018, and your inputs are most welcome. A meeting in September 2017 of the South Asia Media Solidarity Network (SAMSN) in Kathmandu hosted by the IFJ, focused attention on zones in the region in need of urgent intervention to protect press freedom and journalists’ rights, one of which was Kashmir. The IFJ situation report on Kashmir is based on meetings with journalists, young reporters, press photographers, editors and media owners in Kashmir in November 2017 and highlights the situation of journalists, and press freedom in Kashmir. Download here. 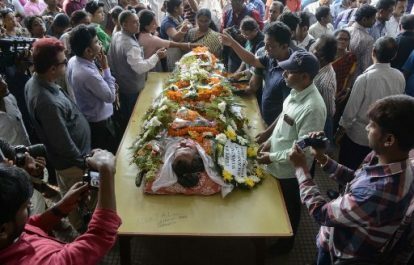 Sudip Dutta Bhaumik, a senior journalist with Syandan Patrika, a Bengali language newspaper of Tripura, was shot dead near Agartala, capital of Tripura state in northeast India on November 21. He had gone to meet the Commandant of the Second Battalion of the Tripura State Rifles (TSR) at RK Nagar about 20 km from Agartala. Bhaumik had obtained an appointment with the Commandant, but when he reached the office, there was a dispute with the armed Personal Security Officer (PSO) of the Commandant. The PSO, Nandu Riyang reportedly shot Bhaumik at point blank range. The Commandant and three riflemen were arrested in connection with the murder. More here. Husain Nazari, a cameraman in Rah-e-Farda TV, was critically wounded in a suicide attack at a political gathering in Kabul on November 16 and succumbed to his injuries at a hospital on November 17. His colleague reporter Taqi Sadid was also injured in the attack and is undergoing treatment. The explosion outside the Qasr-E-Naween Hotel in Kabul claimed the lives of 19 people including eight policemen. The Daesh (also known as ISIS) has reportedly claimed responsibility for the attack. More here. Kashmir police arrested French freelance journalist Paul Comiti in Srinagar, Jammu and Kashmir region, India on December 10, 2017 for ‘violating visa regulations’ by filming protest activities in Kashmir, and presented him to the court, which remanded him on custody for five days. Comiti, 47, was visiting Kashmir to research for his documentary on a business visa valid until December 2018. The police charged him with violating the Passport Act and carrying out activities not permitted under a business visa. He was waiting for the necessary permits, requested more than two months ago, before starting to film and was meeting military officials, separatist leaders and human rights activists. Released after four days in police custody, Comiti expressed ‘shock’ for the people of Kashmir. More here. The Pakistani authorities ordered to take down all television news channels and blocked access to some social media platforms on November 25 following a political demonstration in Islamabad. The Pakistan Electronic Media Regulatory Authority (PEMRA) issued a directive prohibiting live coverage of the operation to end the Faizabad sit-in protest. Following the directive, most news channels were taken off-air in Islamabad and other parts of the country, displaying the message: “This channel is suspended on orders of PEMRA”. The Pakistan Telecommunication Authority (PTA) also directed the blocking of Facebook, YouTube, DailyMotion, Twitter and Instagram in some parts of the country on the Interior Ministry’s orders. While internet services in Faizabad, Rawalpindi where the protests were happening, were also suspended. The directives stood for nearly 28 hours after they were withdrawn on November 26. More here. 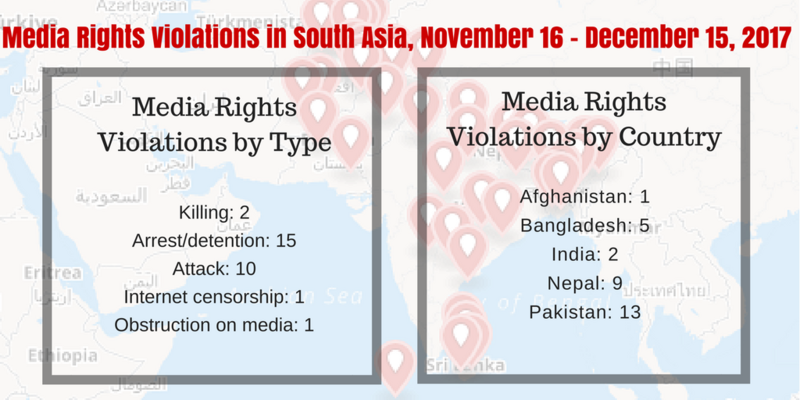 Pakistan recorded increasing incidents of attacks on journalists and violations of journalists’ rights last month. In Kohat city of Khyber Pakhtunkhwa province, television journalist Aleem Haider Zaidi was shot and injured in an attack under mysterious circumstances near his house in Garhi Atta Khan on November 24. Meanwhile, three journalists were subjected to attacks as the security agencies cracked down on a political protest in Rawalpindi on November 25. Senior reporter Qamar Munawar of Dunya TV and Channel 24 reporter Sadam Mangar sustained injuries while senior photojournalist Tanveer Shahzad of Dawn was attacked by protesters on Murree Road. Two reporters of Geo News – Tariq Abul Hassan and Talha Hashmi were also injured while covering the protests. The DSNG vans of Samma, Abb Tak and Geo were attacked and damaged. The protesters on November 22 attacked two senior photojournalists as they covered the clash with the police. Muhammad Asim of Dawn and Jahangir Chaudhry from Jang sustained minor injuries as a crowd with staffs attacked them. On November 24, paramilitary forces detained five tribal journalists and a press club employee after a magnetic bomb was discovered beneath the car they were riding in Landikotal town in Khyber district bordering Peshawar. Four journalists were freed after 12 hours while owner of the car – Khalil Afridi – was still detained and grilled for the magnetic bomb, according to the Freedom Network Pakistan. The detained journalists were Khalil Afridi of Khyber News channel, Farhad Shinwari of Mashaal Radio, Mehrab Shah Afridi of Tribal News Network, Umar Shinwari of Pakistan Television and Imran Khattak of Khabran newspaper. More here. Four journalists – Saikat Afroz, 35, of Somoy TV, Rizvi Joy and Milon Hosssain, 25, of ATN News, and Partho Hasan of DBC News – were attacked in Pabna of Rajshahi Division, Bangladesh on November 30. A group of 25 to 30 people carrying sticks and iron rods attacked them on instructions from Shirhan Sherif Tomal, the son of Land Minister Shamsur Rahman Sherif. The journalists were recording footage of people damaging banners and posters welcoming the PM hung by Tomal’s rival groups. Tomal surrendered to the police and was remanded to custody. More here. Anisur Rahman, a 33-year-old journalist with Daily Sangbad in Roumari upazilla, Rangpur in northern Bangladesh was arrested under the controversial Section 57 of the ICT Act on November 21. He was charged with taking a “screenshot” of a Facebook post involving the president and the prime minister and for showing it to the local people. Similarly, the police arrested two online journalists – Md Layes Mondol and Md Sabid, from Trishal upazila, Mymensingh, northern Bangladesh on November 21 on charges of publishing ‘false and fabricated’ news involving the Bangladesh Army and former chief justice. The news was published in the news portal Trishalnews.com on November 16. Meanwhile, The Wire, an Indian online publication, claimed that the Bangladesh government had blocked access to its website a day after it published an article on the role of Bangladesh’s military intelligence agency in the illegal pick-up and secret detention of an academician. More here. At lease eight journalists including Khem Thapaliya of Jaljala monthly, Jitendra Maharjan of Nihugu Jwojalapa monthly, Dipesh Shahi of Madhyanha daily, Kalibahadur Mahatara of Janaprabhat weekly, Jagadish Nath Yogi, Prakash Dumbre of Garjan Post weekly, Jayashwor Acharya and Padam Prasad Pokhrel of Pyuthan Mission monthly were arrested from different parts of the country in November in connection with the election security. Dumre is still in detention and charged under the Arms and Ammunition Act. Read more here and here. A gang led by a cadre of a political group on November 25, the eve of the first phase of the general election, attacked Dinesh Thapa, correspondent of OnlineKhabar.com at his home. Thapa sustained injuries on his chest and back. More here. Despite international recognition of the need to protect journalists and communicators worldwide through UN resolutions and plans on impunity and the safety of journalists, there is an implementation and effectiveness gap between global agreements and local realities. This weakens the system and means that the complex risks faced by journalists, media workers, and communicators remain unaddressed at the national level. In Bangladesh, where 20 journalists were killed in just the last four years, this failure to address journalists’ safety and impunity has had serious consequences. ARTICLE 19 has highlighted the issue of increasing attacks against journalists, bloggers and human rights defenders and ongoing impunity as a major area of concern, in a submission for Bangladesh’s third UPR cycle. Read the briefing here. In Pakistan, journalists have long been subject to high levels of violence when dissenting against state policies or draconian and orthodox interpretations of Islam espoused by extremist elements. Pakistan’s constitution does establish freedom of the press, but it is a frail freedom, circumscribed by laws that protect Islam and the security and defense of the country. There are official curbs on speech and unofficial ones. Officially, the press is free in Pakistan, but the individuals who constitute it are not. Pakistan’s blasphemy laws dangle like the sword of Damocles over journalists who report on issues that can irk religious conservatives, the military or the powerful strongmen who regularly rob the country’s coffers, any one of whom can orchestrate an accusation that can put an end to talk of those issues — or to lives. But the blasphemy laws are not the only tool in the government’s persecution kit. Read more. Balochistan, in the west of Pakistan, has been the scene of a long-running nationalist insurgency. Foreign journalists need to seek special permission to visit the majority of the province, while the Pakistani media is often wary of reporting on what is considered to be one of the most sensitive issues in the country. More than a dozen towns, cities and districts in Pakistan’s restive province of Balochistan have been without newspapers for the past month. Journalists are too scared to produce them, and vendors are too afraid to sell them. The doors of the local press clubs are locked. Read more. Thirty-two IFEX members, including IFJ, the Federation of Nepali Journalists (FNJ), Afghanistan Journalists Center, Bytes for All Pakistan, and Freedom Forum Nepal demanded that journalist Zeenat Shahzadi of Pakistan be immediately released to her family, and that her freedom of movement be fully restored. Shahzadi,, who was abducted from Lahore on August 19, 2015 , was recently recovered after two years in captivity, yet she has not yet been released from government custody. There is no justification for this delay. Read more. In Bangladesh, frivolous lawsuits can be used as a way to harass journalists – and come with serious consequences. Under Section 57 of the ICT Act, anyone convicted of publishing material online deemed to be false, obscene, defamatory, likely to harm law and order, tarnish the image of the state or an individual, offend religious sentiments, or provoke individuals or organizations faces a maximum 14 years in prison and USD120,000 fine. In the first four months of 2017, at least 21 journalists faced criminal complaints under its provisions. Read more. On November 8, independent news website LankaeNews was blocked across all Internet Service Providers (ISPs) in Sri Lanka. Subsequently, a few online websites filed a request for information under the Right To Information (RTI) Act of Sri Lanka in order to gain more information and shocking details emerged about the process of blocking of news websites. Groundviews and its sister websites Vikalpa and Maatram filed requests as per the RTI Act in order to get more information, and received documents that show the details of the blocking process in Sri Lanka. Read more. The number of journalists imprisoned worldwide hit another new record in 2017, and for the second consecutive year more than half of those jailed for their work are behind bars in Turkey, China, and Egypt. The pattern reflects a dismal failure by the international community to address a global crisis in freedom of the press. In South Asia, eight journalists are in jail with Bangladesh putting four behind bars and India and Pakistan two each. Read more. The targeting of Tamil journalists in Sri Lanka’s North-East contradicts the government’s claims of media freedom, the Jaffna Press Club has said. In a statement, the Press Club said that consecutive Sri Lankan governments have failed to bring justice for at least 41 Tamil journalists and media workers killed or forcibly disappeared during the war. “On one hand Tamil journalists are forced to work in an unsafe environment,” it said. “On the other hand those behind the attacks and threats are never put before the law.” Read more. French Justice Minister Ms Nicole Belloubet on December 12, 2017 handed Freedom Network, a Pakistani civic liberties organization working on issues of freedom of expression, media freedoms and safety of journalists, France’s prestigious Human Rights Prize. The French Republic’s Human Rights Prize was awarded to Freedom Network for its “excellent work for Freedom of Information, Freedom of the Press and Journalism.” The prize, which was set up in 1988, is awarded in recognition of the excellence and impact of the recipient’s work. Read more. International Association of Women in Radio and Television (IAWRT) launched What if…? Safety Handbook for Women Journalists, authored by journalist Abeer Saady in November, 2017. The handbook provides practical tips for women journalists on how to minimize risks when covering sensitive and dangerous assignments. Read more and download here.